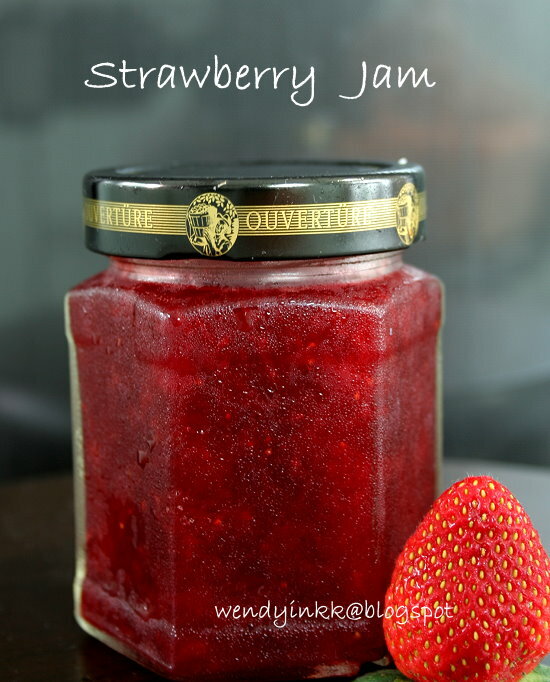 Strawberry jam... seen a lot on supermarket shelves? Whenever I open a jar of commercial jam, usually I smell the sugar rather than the fruit. I know not all brands do, but most of them do, not gourmet jams that costs RM20 above, not those. And commercial jams taste soooo sugary that... you can only spread a thin layer of it onto the bread. With that thin layer, how much fruit do you get to taste? Some budget jams don't even have any fruits in it, but just colouring and flavouring. Cameron Highlands is the major strawberry production area in the country. And strawberry jam is sold everywhere there. Most of them smell of "sugar" and are overly sweet. Those sold at RM5 per bottle look like remnants from the strawberry cordial production, lots of pulp, but not much colour. The best that I have tasted so far, is from Cameron Highland Resort (under YTL group), at a price slightly higher than Raju's or Kasimanis, but the taste is better. The biggest vegetable stall at the night market here in KK sells strawberries sourced directly from Cameron Highlands. 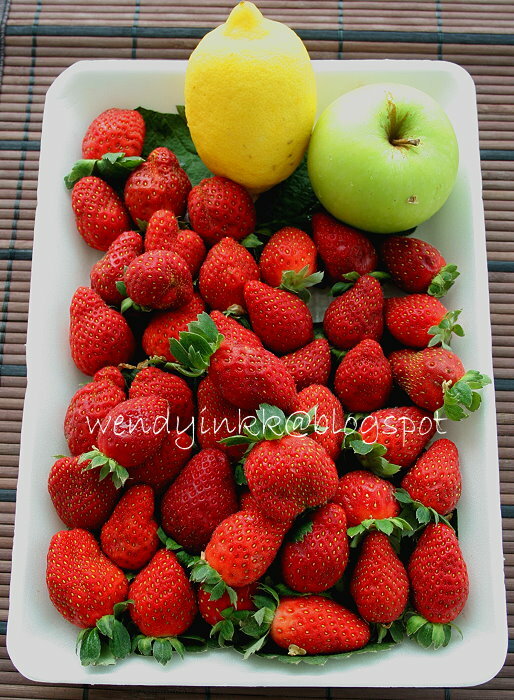 Whenever I buy vegetables from them, I will buy strawberrries too, if they still have it, stocks are limited. It's RM11/500gm. They are very red and don't grow fungus easily, not until you touch them with your bare fingers and leave them unwashed after touching. Easily lasts 2-3 weeks chilled. I made this jam on impulse. Because I have 500gm of strawberries in the fridge for 2 weeks. And the kids were sick, so, eating them fresh and cold was not a good idea, will make them cough even more. This is my recipe. And I'm sticking to this. The ratio of ingredients is just right for me, texture and flavour wise. 1. Wash and cut strawberries (some I quartered, some I halved). 2. Peel and grate the apple. 3. Zest and juice the lemon. 4. 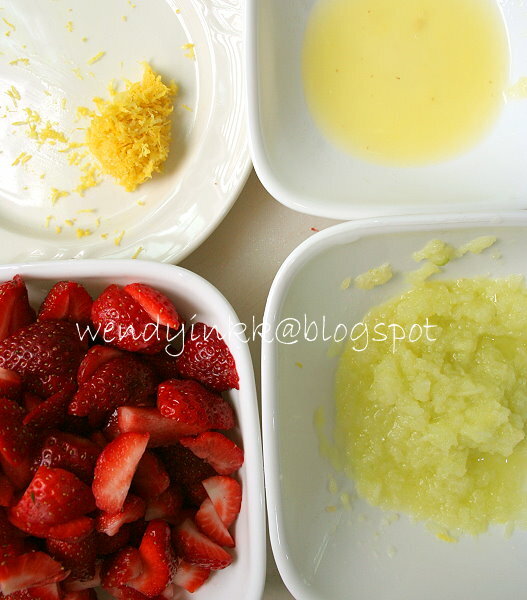 Combine strawberries, grated apples, lemon juice and lemon zest in a non reactive pot (glass or stainless steel) and cook on medium heat (lid off) until it feels spongy (I don't like the setting stage, it becomes too hard). Don't forget it will continue to thicken after cooling. This jam can last pretty long in the fridge, 3 months opened is not a problem. Unopened in sterilized jars can be kept even longer. Take note that if you choose to further lower the sugar, the jam might not be glossy and may not keep well that long. This amount of sugar with the lemon and apple still gives the jam a slightly tart taste. Lydia loves jam a lot, but Lyanne doesn't. Previously Lyanne takes jam, but recently, she only takes Nutella and Kaya. Fruit jams all no no! Lydia on the other hand loves to lick her jam and then eat her bread, LOL. She won't mind eating the jam with a spoon. Looks so doable. I should really try as I feel the same about commercial jams. And I do want more fruits than sugar in mine. Thanks for sharing. Not a prob to use even more fruits, but do take note that too low sugar and the jam won't turn glossy, if that's ok with you. Low sugar jams can't keep long. I think once you've eaten homemade strawberry jam, you wudnt want to buy those artificial blood-red types from stores because frankly, strawberries don't have that sort of colour. Never used apples before...will give that a try. Wendy, I love the color of your jam. Glistening and ruby red. And it seem quiet easy to make too. Love this! should you keep the skin of the apple as well? Haha, mine are all bloody red. Always bloody red cos I buy only Cameronian straws to make jam because they are usually ripe to the core. How red depends on the quality of strawberries. I understand your point, but it's that bit of lemon juice that brings out better flavour from the jam. Without the lemon.... there's less zing to the nose, it's not detectable as lemon, but it greatly enhances the jam. Hi Wendy, fully agree with you. Very lovely jam. I like. I just bought two punnets of aussie strawberries coz they were on promotion. Am going to make this tonight. Perfect timing. Thanks for sharing. Homemade jam is always the best. Your strawberry jam looks beautiful. Adding Green apple is such a refreshing idea. I mush prefer Homemade jam too and failing that I'd look for Gourmet jam which tend to have less sugar. That reminds me I still need to use up those Cameron Highlands strawberries! 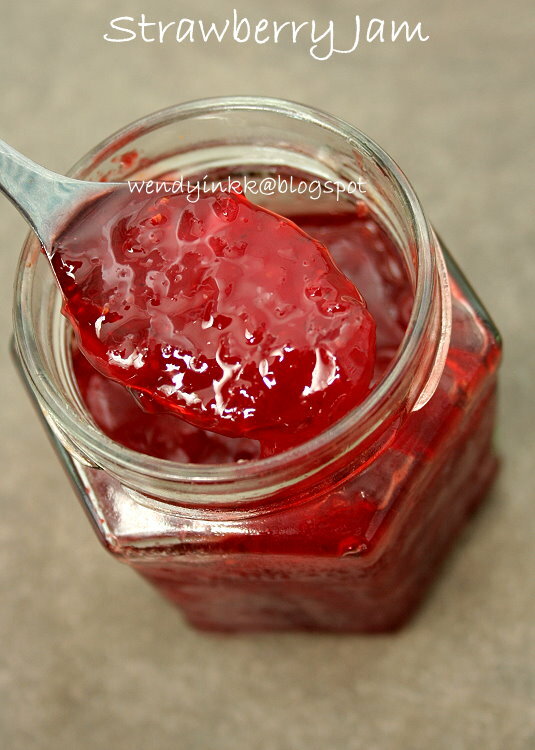 Your jams always have that lovely transparent look which I like very much:) Great color too! This is why I ove to make my own jam. It's so easy plus you know what has gone into it. I like to add a sweet fruit to sour ones so that I don't have to use too much sugar. i know jams are easy to make but i dont know why i'm not making them yet..but will and must! from your this recipe, i use grapes and apple but no lemon oh.. i'm wondering what does lemon work in this jam? thanks for sharing..
Lemons will always bring out the flavour of strawberries, it will greatly enhance it. Do you mind to share how u sterillise you glass jar? Thanks. You can boil them in water for 2 minutes or bake in 150C oven (with 1 tsp water in it) for 5 minutes or until all the water has gone. 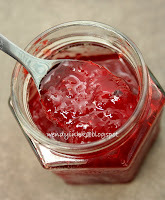 Make sure jar is dry before u fill up and don't touch the inside with fingers or cloth before u fill with the hot jam. you cooked it way too long. It will thicken further upon cooling. may i know where do you buy the jam jar? or do you reuse the jam jars from commercial jams? can i reuse the lids? I used old jars from store bought jam, given by others. If the lid doesn't rust, I'll reuse it.